a shelter.a woman is in front of the shelter.a 2 feet tall suitcase is right of the woman.a 30 feet long fence is 8 inches behind the shelter.a first tree is 12 feet behind the shelter.a second tree is -1 feet left of the first tree.the ground is grass.a lime light is above the first tree.a man is right of the suitcase.the man is facing northeast.the man is 1 feet in front of the suitcase.a rose is -24 inches left of the man.the rose is 4.5 feet above the ground.the rose is face up.the rose is facing left.a third tree is 20 feet behind the second tree.the sun is pink.a fourth tree is 20 feet behind the third tree.a small lake is 10 feet right of the fourth tree.a fifth tree is behind the lake. the car is on the extremely long road. the billboard is to the left of the road. it is 10 feet behind the car. it is facing right. 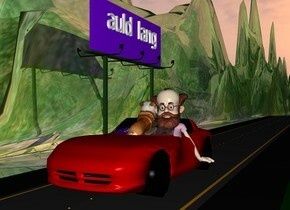 the large "auld lang" is -3.5 feet to the right of the billboard. it is -5 feet above the billboard. it is facing right. the large dog is 3 feet in the car. it is facing back. it is leaning 20 degrees to the back. the man is -2 feet to the right of the dog. the shiny ground is 200 feet wide. 9 policemen are behind 8 policemen. A dim light is behind the policemen. 10 policemen are behind the policemen. A policeman is behind the policemen. A 200 feet tall City is 50 feet in front of and -1200 feet left of the policeman. The ground is shiny [snow]. A 200 feet tall City is 50 feet behind and -1200 feet left of the policeman. An extremely long clear 5.8 feet high flat wall is 15 feet in front of the policeman. It is leaning 15 degrees to the back. An extremely long 4 feet high clear flat wall is behind the wall. 4 beige lights are in front of the policeman. A gold light is above the light. A dim light is above the light. A light is left of the light. A huge dark gold bell is 3 feet above and 25 feet in front of the policeman. It is leaning 20 degrees to the left. A dim blue light is -4 foot above the bell. 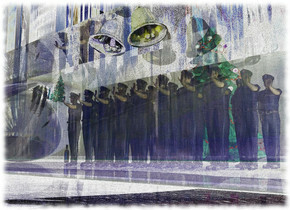 A huge silver bell is right of the bell. It is leaning 20 degrees to the front. A dim blue light is -4 foot above the bell. A cyan light is 5 feet left of the policeman. Camera light is cream. The azimuth of the sun is 45 degrees. A 20 feet high silver sphere is 15 feet right of the policeman. A large Christmas tree is behind the policeman. A large bottle is left of the sphere. a 6 feet long and 8 feet deep pink cushion. a clear white woman is -0.4 feet above the cushion. she leans 90 degrees to the back. she is upside down.a tiny marble is -0.57 feet above the woman. 3 pink lights are -0.53 feet above the woman. the sky is [purple]. the ground is clear. 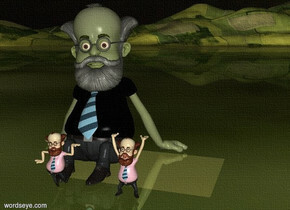 a 20 inch tall 60% dim pewter gray 1st man is on the ground.the beard of the man is gray.the moustache of the man is gray.the shirt of the man is 38% dim gray.the hair of the man is gray.the eyebrow of the man is gray.a 2nd 6 inch tall man is -20 inch above the 1st man. the 2nd man is in front of the 1st man.a 3rd 6 inch tall man is 3 inch right of the 2nd man.ground is grass.ground is 60 feet tall.it is evening. a 250 feet wide lake. a large pine tree is -170 feet to the right of and -130 feet behind the lake. a 25 feet tall and 5 inches wide [hide] tube is -35 feet to the front of and -15 feet to the left of and -85 feet above the tree. it leans 53 degrees to the back.a 5 feet wide black donut is -18 feet above and -1.3 feet to the front of the tube. it leans 64 degrees to the back. 1st boy is 2 feet in front of and 1 feet above the donut. he leans 8 degrees to the back. the shirt of the 1st boy is tan. a giant boulder is -7 feet right of and -10 feet to the front of the tree. it faces left. it is -1.5 feet above the ground. 2nd large boy is 0.5 feet above and 1 feet in front of the boulder. he faces southwest.the shirt of the 2nd large boy is cream. a 17 feet tall girl is 3 feet left of and -2 feet to the back of the boulder. she is -9 feet above the lake. she faces southwest. the torso of the girl is [pattern]. a large oak tree is 60 feet right of the boulder and on the ground. a large sycamore tree is -1 feet in front of the oak tree. the ground is grass. a 5 feet high and 8 feet wide and 5 feet deep shiny jar is 1.0 feet in the ground. a dodo is -4.04 feet above the jar. 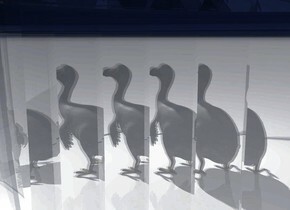 a white light is above and in front of the dodo. the ground is shiny white. the sky is baby blue. it is noon. my memory is somehow scrambled ! 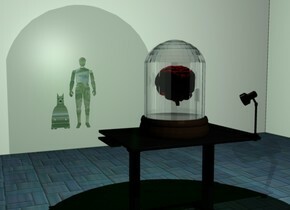 a clear white dodecahedron.a 3 feet tall man is 20 feet behind the dodecahedron.a 3 feet tall woman is left of the man.the man is facing southwest.the woman is facing southeast.a rust light is 1 feet in front of the man.a white light is left of the woman. 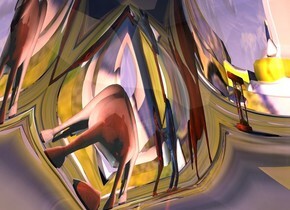 [art]ground.a 2 feet tall horse is 1 feet right of the man.the horse is facing right.a 2 feet tall hourglass is 2 feet right of the horse.a unicorn is 2 feet left of the woman.the sun is pink. 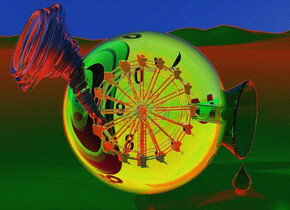 a 20 inch tall clear green yellow sphere.sky is ink blue..ground is 70% dim rust.a 15 inch tall clear white tornado is -10 inch left of the sphere.ambient light is gold.tornado is facing the sphere.tornado is -14 inch above the sphere.tornado leans 45 degrees to back.camera light is white.a 10 inch tall silver ferris wheel is 15 inch in the sphere.a 10 inch tall clear green funnel is -10 inch right of the sphere.the funnel leans 90 degrees to southwest..the funnel is -18 inch above the sphere.a 1st 4 inch tall clear green drop is -4.5 inch right of the funnel.the 1st drop is -18 inch above the funnel.behind the sphere is a 16 inch tall clock.in front of the clock are six gold lights.the clock is -24 inch left of the sphere. 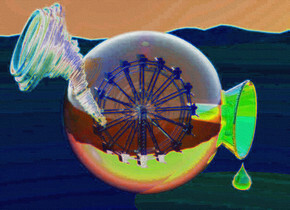 a 20 inch tall clear green yellow sphere.sky is ink blue..ground is 70% dim rust.a 15 inch tall clear white tornado is -10 inch left of the sphere.ambient light is gold.tornado is facing the sphere.tornado is -14 inch above the sphere.tornado leans 45 degrees to back.camera light is white.a 10 inch tall silver ferris wheel is 15 inch in the sphere.a 10 inch tall clear green funnel is -10 inch right of the sphere.the funnel leans 90 degrees to southwest..the funnel is -18 inch above the sphere.a 1st 4 inch tall clear green drop is -4.5 inch right of the funnel.the 1st drop is -18 inch above the funnel. 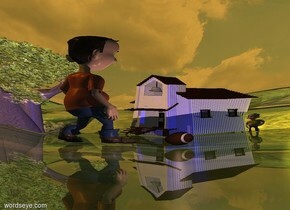 a humongous drop.a schoolhouse is 80 feet behind the drop.the schoolhouse is facing southwest.a yellow light is 1 feet right of the schoolhouse.a blue light is 1 feet in front of the schoolhouse.shiny ground.a boy is 10 feet behind the drop.the boy is 8 inches left of the drop.the boy is facing northeast.the boy's shirt is rust.a ball is right of the boy.the ball is facing northeast.a pink light is in front of the ball.a man is -8 feet right of the school.the man is facing the boy.a tree is left of the school.the man's shirt is yellow.the sun is orange.the man is 5 feet in front of the school.